During recent years, many cosmetic and skin care companies have released their own versions of what they call the best facial oil. A lot of women think it is odd to include face oil in their daily beauty routine not knowing that this regimen was first introduced by ancient Egyptians. Before moisturizers were invented, face oils were the best-kept secrets of Egyptians. And now they are making a comeback. Because some people are still doubtful about using this product, different research has been conducted to support its beneficial claims. But before you learn about its benefits, you must first understand what face oil really is. Face oils are either made of one ingredient or a combination of different oils. Those oils may include fragrant plant oils, non-fragrant plant oils, and synthetic oils. Though it is called face oil, this skin regimen can be applied to different parts of the body like the neck, back, nails, scalp, and hair. There are different types of face oils on the market today. Manufacturers use different ingredients such as jojoba, argan, red raspberry, and evening primrose. As you may have noticed, each type or ingredient has different key benefits. This is because no face oil is the same. Some are good at anti-aging while others are good at SPF protection. Are All Face Oils Good for You? Most manufacturers will state that their face oil is good for all types of skin on their product description. However, experts say that not all oils will work great for you. Since people are genetically different, some face oils might have a different reaction on your skin. Therefore, you need to take extra care. If you are asking if you should use a face oil, then the answer is definitely yes because your regular moisturizer is usually not enough. Whether you just want to keep your skin healthy or soothe common skin problems, a face oil can surely help you. Most of the brands today have rich amounts of vitamins that provide a moisturizing effect, something every type of skin needs. Instead of searching for a new moisturizer, why not add one of the best face oils to your routine? This allows both skin products to provide you with better results. Many people have tried it and said that the effect is smoother, softer, and younger looking skin. In fact, you will not only look great but also feel great when you combine these two. This means that you do not have to completely eliminate or replace your moisturizer. Apply your face oil under your moisturizer or vice versa, keeping in mind that the one with the most active ingredients should be the first layer. Don’t mind the debate between what is better between the two, as long as you are using your trusted moisturizer. They are better together. What Makes Face Oils a Great Beauty Skin Care Product? Every woman loves to have skin that looks young and vibrant. Face oils are effective moisturizers that hydrate the skin, and therefore slow down aging. Most of them are rich in antioxidants that promote elasticity by neutralizing free radicals. One mistake that people with oily skin often commit is to use harsh stripping products. They don’t realize that the lack of natural oil in the body will cause the glands to reproduce more. The better way to combat it is to use face oil that mimics the body’s natural oils. This way the production will be balanced and skin will look naturally nourished and glowing, not greasy. Everyone knows that oil is essential during the winter season because it hydrates the skin when the weather is cold. What you do not know is that it is good for all seasons. Another benefit of some face oils is their ability to protect the skin from harmful UV rays. Apply it together with your sunscreen so that your skin will be protected and moisturized even if you spend long hours bathing in the sun. Now that you know the wide range of benefits of face oil, it is time to learn about some of the most recommended brands on the market. The following products are considered as the best oils for the face because they have an average of more than four stars when it comes to their satisfaction rating. Read their short description and find out if one of them is what you need for daily use. 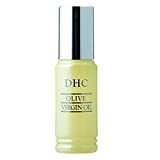 DHC Olive Virgin Oil, 1 fl. oz. First on our list is the Beauty Rosehip Oil by Radha. This product has received positive reviews online because it is affordable and effective. For a reasonable price, you will get their 4-oz. bottle. This is most cost effective, making them a better choice over other products. 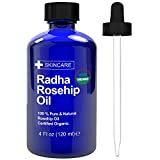 This rosehip oil is 100% cold-pressed, meaning it is extracted directly from the rosehip seed with no additional chemicals, fragrance, or toxins that might be present in some moisturizers. The product promises to revitalize skin to make it look brighter and more radiant. Aside from this, it also reduces the appearance of fine lines, wrinkles, scars, and stretch marks. What is more is that rosehip oil can soothe burns, dry skin, and eczema. If you are suffering from psoriasis or hyperpigmentation, this is your best option. You can even apply it to brittle nails and damaged hair. This product is perfect for everyday use because it leaves skin soft and not greasy. All this is possible because this product is rich in vitamins A, E, and Omega 6, 3, and 9 fatty acids. Aside from this, the manufacturer also guarantees to return the payment in full to those who are not satisfied with the product. For these reasons, there is no risk in buying and using this product. Lastly, it comes complete with a free guide or instruction via email. 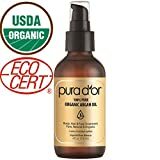 PURA D’OR Moroccan Argan Oil is another 4-oz. face oil that is very affordable. It is also 100% pure cold-pressed and risk-free. Like the first oil, it is certified organic with no added parabens, artificial colorants, or harmful chemicals. In fact, it has passed the standards of the USDA. It is guaranteed safe and made of high-quality argan oil. According to the manufacturer, this product is the best-kept secret of the stars. And since argan oil is quite rare, it tends to be more expensive than other face oils. However, the company made it affordable to the public so everyone can have young and glowing skin. Although the product only contains one ingredient, it is rich in vitamin E and antioxidants that are essential for protecting the skin from long-term damage. Aside from reducing fine lines, wrinkles, stretch marks, and facial blemishes, this product is also responsible for restoring the elasticity of your skin. The result is softer and smoother skin. Adding to the list of its benefits are its ability to repair dry, frizzy hair and brittle nails as well as to protect skin from cold winds and pollution. Furthermore, this Moroccan Argan Oil is hypo-allergenic, which is why it safe for face, skin, hair, and nails. Many reviews say that it is a good moisturizer for skin, leaving it grease-free. It works well an anti-aging and anti-bacterial treatment in addition. Manufactured in a facility in California, this product adheres to the highest manufacturing standards of the USA. 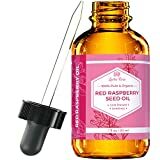 Red Raspberry Seed Oil by Leven Rose is among the best brands of its kind with a whopping 4.8/5-star of satisfaction rating on Amazon. For a reasonable price, you will get a bottle with 1 fluid oz. of face oil that you can apply daily. Like the first two, it is also made of natural, unrefined, and organic cold-pressed oil. The company did not compromise the quality of the face oil by adding fillers, parabens, GMOs, or other harmful chemicals. Instead, they stuck to using one ingredient that contained rich amounts of vitamins A and E. This way, there is less of a chance for negative side effects, which is common when using over the counter moisturizers. Aside from making your skin look youthful and glowing, the product also protects it from harmful UV rays. This is because red raspberry oil has natural SPF properties, something that other face oils do not have. If you are a frequent traveler, this oil is a must have. It even goes well with your sunscreen. Of course, the product is also responsible for providing relief for those suffering from eczema, psoriasis, burns, and rashes. Not only that, it also deals with stretch marks, wrinkles, and other signs of aging. Packaged in a dark amber glass bottle with a glass stopper, the manufacturer advises that it should be stored in a cool, dry place. It promises that this oil will work for all skin types. Pur360 Tamanu Oil is not only ranked number four here on this list but also on Amazon under the face oil category. With a 4.4/5 star satisfaction rating, this 1 fluid oz. bottle has been bringing dramatic changes to most of its buyers. Like other face oils, this one is ideal for daily use. It is also cold-pressed and truly organic as certified by the USDA. As proof that they are a reliable and credible brand, all of their bottles have a USDA symbol on them. Since it is pure and organic, there is no trace of fillers, parabens, alcohol, or GMOs found in this tamanu oil. This type of face oil is known as an anti-aging skin care ingredient that makes you look youthful and glowing. This is made possible because it can reduce the appearance of your acne scars, stretch marks, and other general scars. Furthermore, it has the ability to regenerate skin and provide immediate relief to those with psoriasis, eczema, rosacea, burns, and rashes. And if you have mosquito bites, dry and flaky scalp, or overly dry skin, this product is sure to treat them, too. According to reviews, Tamanu Oil is impressively longer lasting than other brands. In other words, it provides moisture to your skin for hours throughout the day. It also works for most skin types, whether oily, sensitive, or dry. The product is packaged in a dark amber glass bottle with a convenient treatment pump. It comes with a money back guarantee from the manufacturer to ensure satisfaction. And if you are going to buy two bottles on Amazon, the shop will ship to your doorstep for free. Unlike the first four, this product comes in a form of serum and not oil. In other words, it is not made of only one ingredient but is a blend of different organic ingredients. Nevertheless, it is still safe for everyone because it is 100% vegan with no added fillers, parabens, alcohol, or other harmful chemicals. 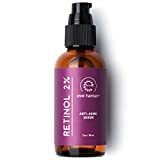 Some of the ingredients in this serum include an organic herbal infusion, organic aloe, botanical hyaluronic acid, witch hazel, pentylene glycol, and phospholipids. All these contribute to the anti-aging and healing power of the product to make your skin look glowing and radiant like never before. 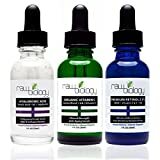 It is also made in the USA and has passed strict standards of high-quality anti-aging serums. Daily use of this serum results in reduced visibility of fine lines, wrinkles, and other signs of aging. It is made possible because of the product’s proven ability to promote collagen and elastin production. In fact, according to many verified purchasers, this serum is able to moisturize and heal skin faster than other brands. Perhaps this is because of the combination of vitamins and essential minerals from the different ingredients. It works for most skin types, leaving anyone’s skin nourished and grease-free. This product is packaged in a pump bottle for easier application. It also comes complete with a money back guarantee from the manufacturer. Although all of the products listed above seem to have the same effect, not all of them will be effective on your skin. They are cold pressed and made from different ingredients; therefore, they have distinct features or properties that make them a better choice over the other. The best way to find out which one of them will be the best oil for face is to do further research. Since it involves the health of your skin, which is one of the most sensitive and important parts of the body, take extra care in using different skin products. Research the types of oil that you should avoid and only choose face oils that are pure and certified organic to ensure safety.